This cannabis stock is unique in that it pays a dividend, currently yielding 3.1%. 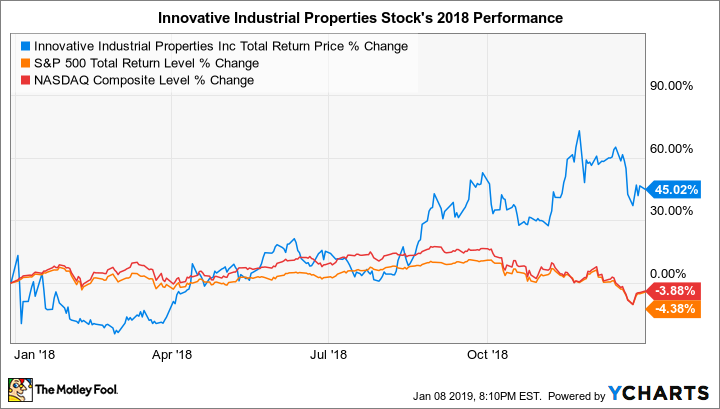 Shares of Innovative Industrial Properties (NYSE:IIPR) returned 45% in 2018, according to data from S&P Global Market Intelligence. The company -- a real estate investment trust (REIT) focused on facilities used for growing and processing cannabis -- owns 10 fully-leased properties in states where medical marijuana is legal. We can attribute the stock's good performance in 2018 to the company's strong financial results, along with investors pouring more money into cannabis stocks in general. Data source: Innovative Industrial Properties. *Adjusted funds from operations (AFFO) are the primary driver of dividend increases for REITs. Innovative Industrial Properties is worth putting on your watchlist. Compared with buying shares of cannabis growers, it offers a way to invest in the fast-growing legal cannabis market that's less volatile -- and that should prove to be less risky.